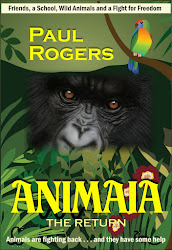 Looking to publish ANIMAIA, The Return with a traditional publisher, so seeking a good agent for this revolutionary high-concept series in young adult crossover literature. With the explosion of interest in animal rights and veganism, the time is right for this unique book of ideas. After some time absent from Amazon Kindle books, ANIMAIA has returned with a few modifications and edits, but no essential changes to the story. One important change is that it is now published under Paul Rogers and not Lee Rogers, as previously. My full name is Paul Lee Rogers. Other work has prevented completion of the second volume, but that is underway. Enjoy your reading. ANIMAIA the series includes four volumes. I've made a start on volume 2. Here are the proposed names of the three additional books in the series -- subject to change of course. I recently put up the map of Animaia (link above). It can be a little tricky building a map when the story is being written progressively over several volumes. Things happen in subsequent volumes that an author cannot entirely predict, unless you're an extraordinary planner and story-boarder. This relates to locations as well. Even so, with ebook publishing there is always the option to update the map in subsequent volumes (and even early volumes). Map was done in Corel, and as you can see, I'm no expert artist or Corel user, although adequate, IMHO!